Things were looking up for reigning Can Am Champions Don Nichols Shadow team in 1975, the Can Am series folded, but the team kept a strong US presence with a Dodge powered DN6 Formula 5000 team which used a similar Tony Southgate designed chassis to today’s featured DN5 design. Following the dominant trend in F1 design the DN5 was built around a slimmer lower monocoque, than the previous years DN3, but with a longer and wider wheel base and track than many. 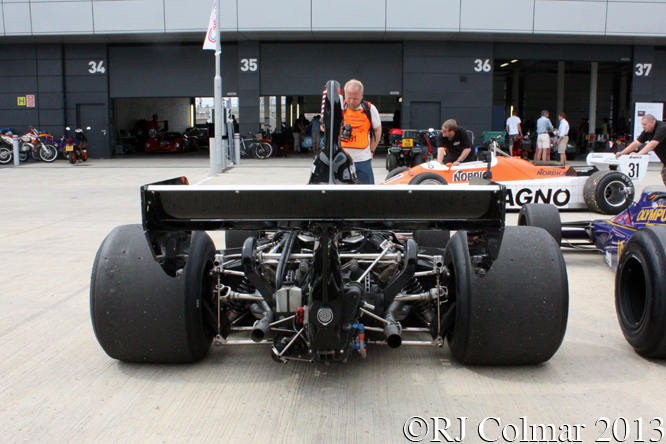 Jean Pierre Jarier put the DN5 #DN5/1A, seen here in the first third and sixth photographs at Silverstone Classic 2013, on pole on the cars debut in Argentina, but the car never started having stripped the crown wheel and pinion in the gearbox on the warm up lap. Jumper was on pole again at the 1975 Brazilian Grand Prix, but retired seven laps short of the finish after the fuel metering unit failed. The non championship Race of Champions at Brands Hatch saw the DN5’s run with a new TV test card like colour scheme and Tom qualified the sister #DN5/2A, seen in the close ups at Donington Park Museum, on pole and then ran away with the race while Jean Pierre finished 4 laps down from 3rd on the grid classified 8th with a fuel pump issue. 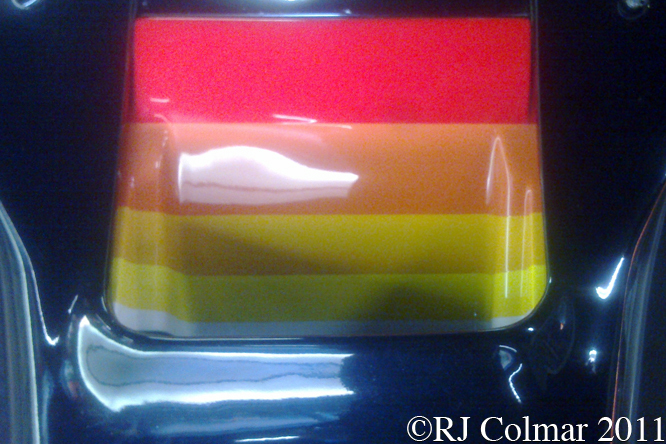 Further highlights of the season came in Spain where JPJ finished a season high 4th from 10th on the grid and at Monaco where still driving the two original chassis Tom and JPJ qualified 2nd and 3rd respectively, but both retired with accident damage which would be the final appearance of JPJ’s #DN5 1A. At the British Grand Prix run at Silverstone Tom won his only career championship pole but retired after an opening lap accident, by now having scored two 6th place finishes in Belgium and Holland. In Germany Tom still driving #DN5/2A converted 16th on the grid to a fourth place finish. Meanwhile keen to find another engine supplier the similar Shadow DN7 with a V12 Matra engine, which I looked at a couple of weeks ago, had been built up for JPJ to drive in Austria and Italy. While the Matra proved not to be quite the fillip to the team’s fortunes that were anticipated Tom drove #DN5/2A to the teams season high 3rd place finish in Austria from 15th on the grid. At the non championship Swiss Grand Prix run at Dijon in France JPJ was once again on pole with the Cosworth powered #DN5/4A, Jumper looked like he was going to break his F1 duck, until the 34th lap from 60 when the transmission broke and he retired from the lead. At the Italian Grand Prix Tom once again drove through the field coming home 6th from 14th on the grid. #DN5/2A’s final appearance came at the 1975 US Grand Prix where Tom qualified 7th but finished unclassified 7 laps down. Having failed to convince Matra of their suitability as a partner for the 1976 season Shadow also lost their sponsor UOP meaning Tony Southgates new Shadow DN8 was put on hold while the team continued running the DN5’s in B spec, which I shall look at next year, that was introduced to meet new regulations from the Spanish Grand Prix. Thanks for joining me on this “Pole Sitter & Sister” edition of “Gettin a li’l psycho on tyres” I hope you will join me again tomorrow for Maserati Monday. Don’t forget to come back now ! 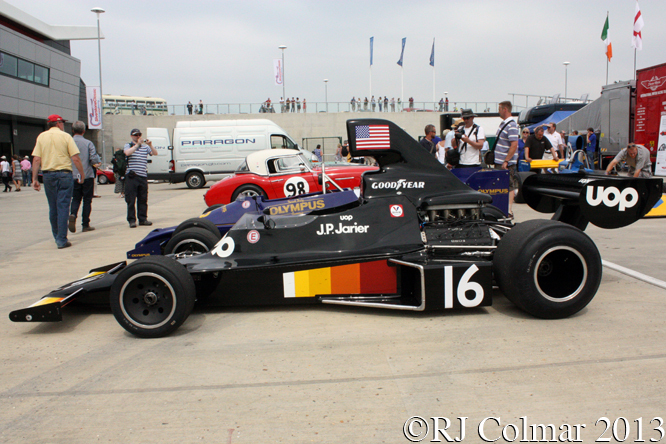 This entry was posted in Uncategorized and tagged Classic, Colmar, Cosworth, DN3, DN5, DN7, Donington Park, Formula, Jarier, Matra, Museum, One, Pryce, Psychoontyres, Ralph, Shadow, Silverstone, Southgate, UOP on August 9, 2015 by Ralph. The Shadow team finished it’s debut 1973 season with two 3rd place finishes, one 6th and one top 10 start with it’s original DN1 model. 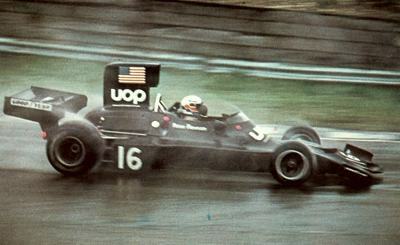 Both 1973 Shadow Formula One works drivers Jackie Oliver and George Follmer retired from the Shadow Formula One programme to concentrate on the successful 1974 Shadow Can Am programme. American winner of the 1973 British and Canadian Grand Prix Peter Revson was employed as the Shadow Formula One team leader for 1974 and he was joined by 1973 Formula Two Champion Jean Pierre “Jumper” Jarrier. The teams existing designer Tony Southgate devised today’s featured car the Shadow DN3 which featured a longer and wheel base and wider track than it’s predecessor. Peter Revson showed the new car was a vast improvement on the old qualifying 4th, 6th and 9th, in the first three events of the season, he retired in Argentina and Brazil and finished a distant 6th in the rain soaked non championship Race of Champions at Brands Hatch. 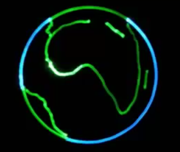 Unfortunately Peter was killed while testing his DN3 for the following race in South Africa an event from which the devastated team withdrew. Jean Pierre Jarrier and the team bounced back with a third place finish in the non championship International Trophy at Silverstone and was joined by Brian Redman for the next three races. At Monaco Jean Pierre qualified 6th and finished an impressive third behind Ronnie Peterson and Jody Schekter. After Monaco Brian, who finished a best 7th in the 1974 Spanish Grand Prix decided to quit the Shadow team in favour of a Formula A/5000 programme in the US with Jim Hall and Carl Hass which would net him three consecutive championships and a lot more cash than Shadow had available. Brian was replaced by Bertil Roos for the Swedish Grand Prix where Jean Pierre qualified 8th and finished 5th. Welshman Tom Pryce joined the Shadow team at the Dutch Grand Prix where Jean Pierre qualified 7th ahead of his team mate in 11th and both cars failed to finish. Tom qualified a season high 3rd at the French Grand Prix where he was eliminated in his second consecutive start line collision. Over the remainder of the season the teams qualifying performances slipped back and the teams remaining point came from Tom’s best 6th place finish in the 1974 German Grand Prix. 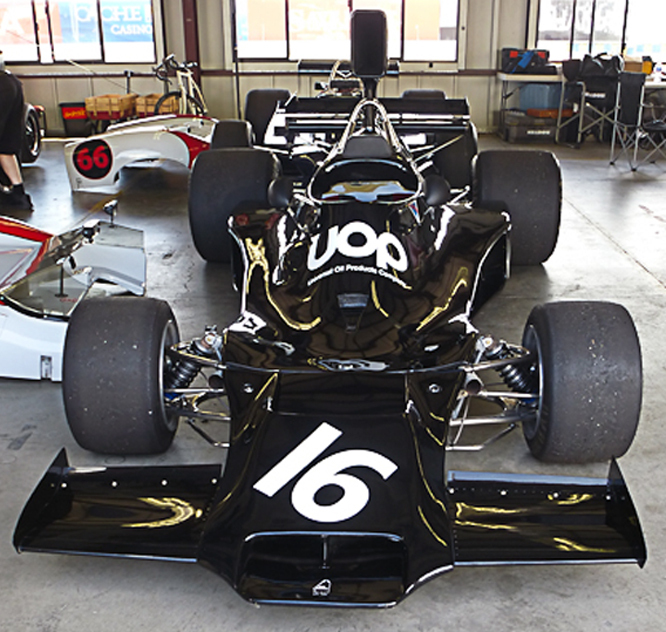 I believe the car seen at the Sonoma Historic Meeting by Geoffrey Horton in these photographs is chassis #5A first qualified 5th by Tom in the 1974 British Grand Prix where he finished 8th and driven by Tom to 6th in the German Grand Prix from 11th on the grid. Tom also drive this car in the Canadian and US Grand Prix retiring from both and there is an unconfirmed possibility that this would have been the chassis James Hunt drove in an exhibition race supporting the 1974 Monterey Grand Prix for Formula A/5000 cars, coincidentally won by Brian Redman. 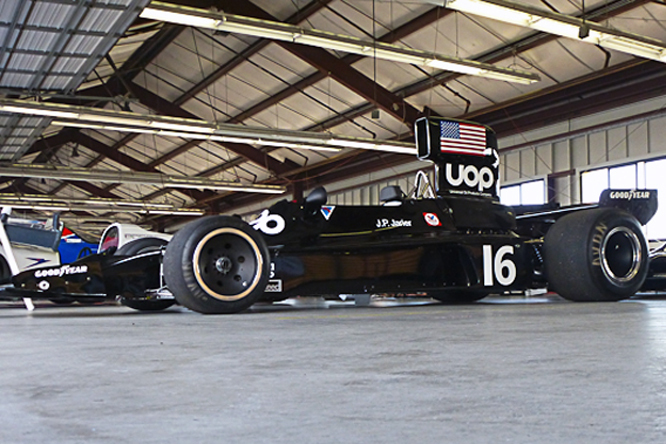 This exibition race between the Shadow Formula One cars and Shadow Can Am cars has been described as one of two grudge matches between Jackie Oliver and George Follmer who respectively won and finished 2nd in the 1974 Can Am championship. For some reason Jean Pierre Beltoise was scheduled to drive alongside his countryman “Jumper” Jarrier in the teams second DN3, but when he could not make it due to injury one of the Shadow Teams 1973 Can Am drivers, James Hunt, was given the drive in the exhibition race. James qualified fastest but finished second to “Jumper” but ahead of George in the surviving Cam Am Shadow DN4. 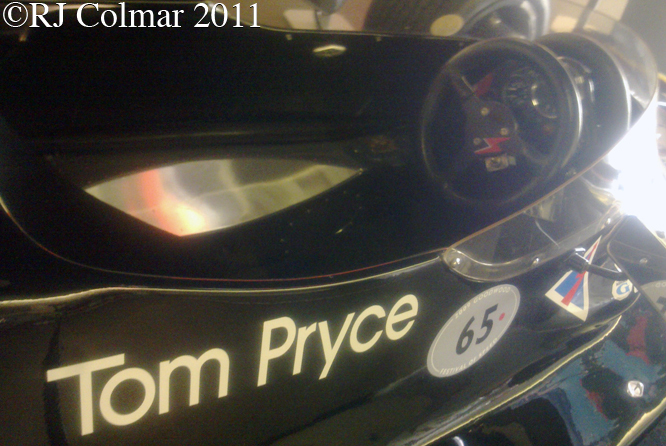 Looking at the photo in this link one can see Tom’s name is taped out on the side of the car James drove at Laguna Seca which alludes to the possibility the car he drove was quite likely chassis #5A, as I say this to not confirmation, but points to a better than even chance that he did. 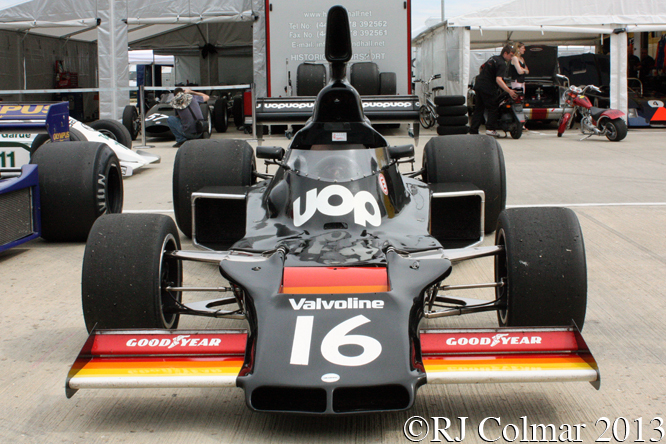 Two years after the Laguna Seca Exhibition race chassis #5A appeared at the 1976 British Grand Prix, sans airbox, entered for Mike Wilds to drive by Team P. R. Reilly, unfortunately Mike was six seconds off the pace and unsurprisingly failed to qualify. Mike then drove #5A in two Shellsport Group 8 races at Snetterton and Brands Hatch finishing 2nd and 6th respectively before the car appears to have been retired from competition. 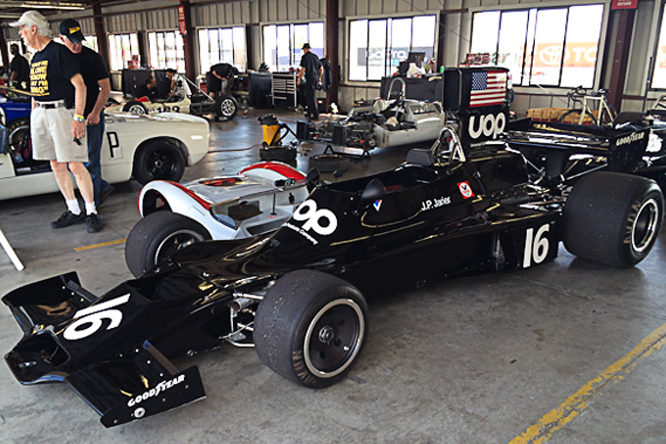 My thanks to Geoffrey Horton for spotting the today’s featured Shadow at Sonoma Historics and sharing these photograph of it. Thanks for joining me on this “Improved Qualifier” edition of “Gettin’ a li’l psycho on tyres” I hope you will join me again tomorrow for Maserati Monday. Don’t forget to come back now ! 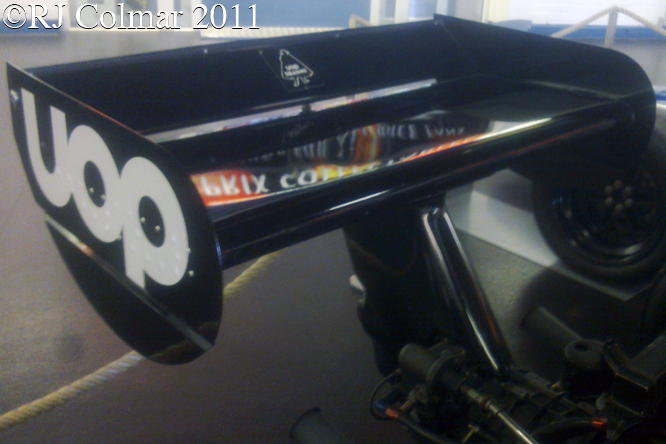 This entry was posted in Uncategorized and tagged Colmar, DN3, Formula One, Geoffrey Horton, Historic, Hunt, Jarrier, Pryce, Psychoontyres, Ralph, Redman, Revson, Roos, Shadow, Sonoma, Southgate, Wilds on November 16, 2014 by Ralph.